Before you read a bit of this post, I would request, no I Demand, that you watch the above clip. OK, Now you are properly prepared for a discussion of this the final chapter in one of the great movie series ever. 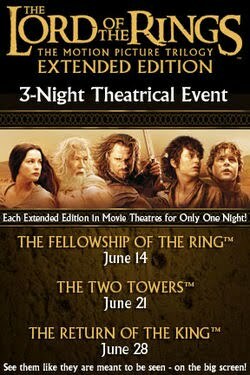 The Lord of the Rings has been viewed as one of the great pieces of literature created in the last one hundred years. It took decades to figure out how to make a movie out of it and it took courage to commit the financial resources necessary to make it. The decision to go for broke and make them three movies, serves the film series very well and does carry on the structure of the books in large part. There are a few thing shifted from one book to another movie but by and large it all worked out. The inspiring speech you saw above could have been the words of encouragement that Peter Jackson used to the studio, or the producers used to their director, actors and technicians. This movie was a massive undertaking and I can easily imagine people losing heart at any given moment and needing to be inspired. Also, this speech could be a inspiration for a number of political movements and you can tailor it to your own leanings and get pumped up. 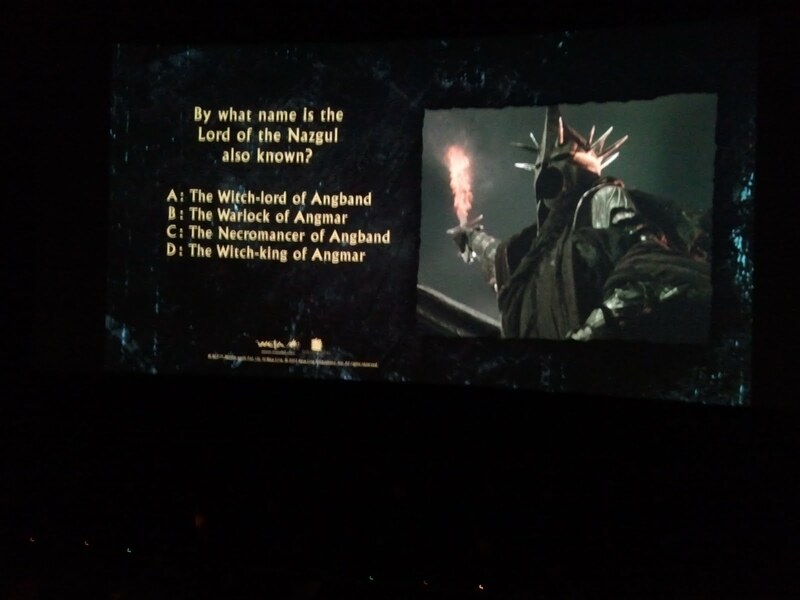 I was pumped to be seeing this on the big screen again. Two weeks ago we started on a Tuesday with Fellowship, last Tuesday it was Two Towers and then last night it was Return of the King. All those people standing in line to see Transformers don’t realize what they were missing on the other side of the door. I am a little miffed because I had stepped out , half an hour before the movie was scheduled to begin, and they played the Peter Jackson Introduction. It was a pleasure to hear him both of the other times and we got some good stories. I missed it and was steaming for the first thirty seconds of the movie because they did not fix this by replaying it at the start. Anyone who was not there a half hour early missed one of the special treats of these Fathom Events. However, by the time Deagol comes up with the ring from the bottom of the river, I forgot all of that and was transported into Middle Earth for all the dramatic climax of the series. There are so many incredibly emotional scenes in the movie, it is hard to list them. Pippin’s melancholic song for Denthonr, Theoden’s decision to come to Gondor’s aid, Sam’s determined defiance of Shelob as she hovers over Frodo, are all emotional button points. I choke up as the signal fires reach from mountain peak to mountain peak, and Gondor’s plea to her traditional ally is sent. Gandalf’s reassuring description of death as the next path, makes Pippen say, “That doesn’t sound so bad”, and indeed it doesn’t; I hope whoever puts my funeral together can dig up this segment of dialogue to reassure my loved ones when I am gone. The most resonant line for me is Eowyn’s declaration to the Witch King that she is no man, as she dispatches him to the oblivion we want all of the Nazgul to go to. The extended edition adds a character that really was needed to the story, The Mouth of Sauron. The visualization of this character was creepy to a fault, and the sly lies and emotional manipulation make Aragorn’s speech even more relevant. 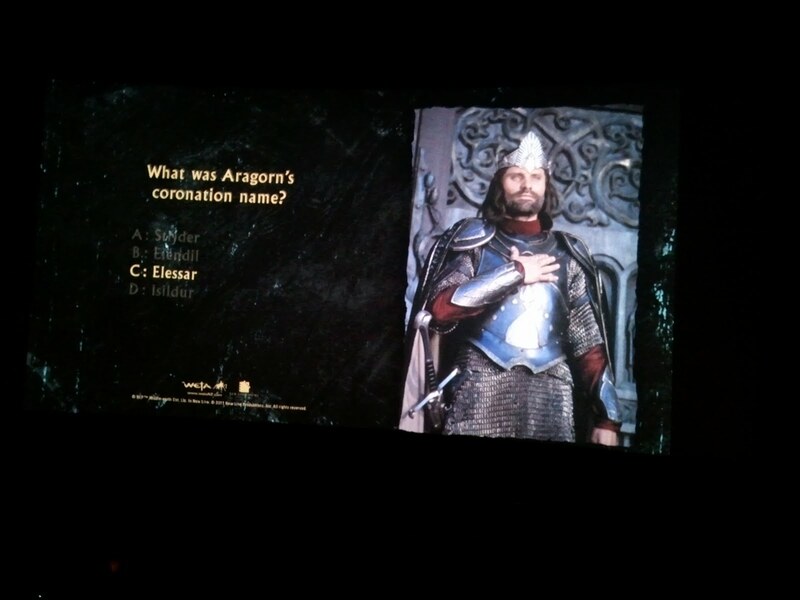 The swish of Aragorn’s sword is one of the cheers that filled the auditorium frequently over the course of the four hour plus version of the movie. I know the film has been criticized and parodied because of the multiple endings over the last half hour but I know all of us want it to go on. We care about the characters and we shared their travails for 12 hours of movie. It is hard to say good-bye. Fortunately, we have “The Hobbit” to look forward to in a couple of years. I don’t know who they have cast as the voice of Smaug, but whoever takes on the role will have a hard act to follow with Richard Boone’s voice work in the animated version from the seventies. This was a pretty satisfying opportunity to look back on films that made a impression on me ten years ago and did the same on the big screen again. We watched it tonight as part two of our Robert Shaw Festival. 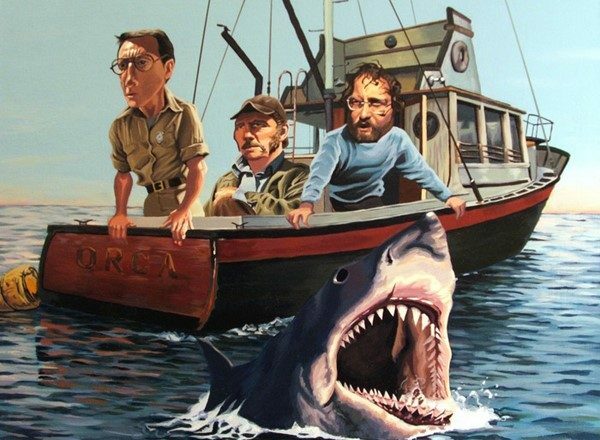 This is his reprise of the Quint character from Jaws, but as I watched it I realized that is a gross mis-characterization. There are several parallels but the truth is, this character is distinct and has greater diversity of emotions than I had originally thought. Shaw uses more of his original accent and that deadly calm demeanor is combined with a more natural personality than quint had. Romer Treece is a figure of respect for his accomplishments, but it is also clear he is a serious man with some romantic tendencies, he is actually pretty sentimental over the young couple he is working with. I liked the relationship he developed with his hulking friend Kevin, and the paternalistic tone he took with the character played by Eli Wallach. I’m glad Wallach got a special Oscar last year, he deserved it, but it is funny to think he outlived Shaw by so long. If you look at the two in this film, Shaw is fairly young and vigorous. He has a dashing older man’s charm and a physique that suggests he can handle himself. Wallach looked old an enfeebled in 1977, yet he is still working today in his nineties. This is again a reminder of what we lost when Shaw died at age 51. He only made two more films after this. I guess it was not a summer release and that’s why it wasn’t in the blog last summer. I know I saw this film at the old Alhambra Twin, in the big theater. It is a very solid, gritty, New York film of it’s time. 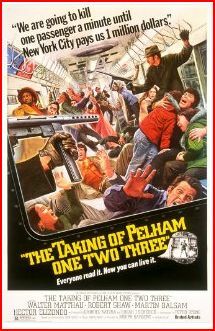 The premise is basic; tough, ruthless men take over a subway car and hold it for ransom. They have a very strict time schedule and they plan on killing a hostage a minute if their demands are not met. as usual, I don’t want anyone to get any spoilers from me, so I will say little more in the way of plot. The remake with Denzel Washington and John Travolta a couple of years ago was acceptable, but it does not hold a candle to the orginal in the tension that builds up. In the original there are some political elements about New York City, but the are not essential to the plot. The remake focuses more on the politics of the transit system and the New York Mayor. This is the movie that seems to have inspired Quentin Taratino when naming his characters in “Reservoir Dogs”, each of the four gunmen having a specific color for a code name; Mr. Blue, Mr. Green etc. They also come equipped with the automatic weapon of choice for early seventies fare, what is revered to in the slang as a “grease gun”. You really get a feel for the city in this movie, it is crowded, and uncomfortable, but it is also familiar and a lot more community oriented than you might be lead to believe by the stereotypes of New Yorkers. At least when it comes to the passengers that was true. The transit authorities have two or three characters that fit the stereotype precisely. Take this line for instance, Correll: “Screw the goddamn passengers! What the hell did they expect for their lousy 35 cents – to live forever?” This is where you get some clever tough dialog and gallows humor. Walter Matthau is first billed and does his usual terrific job. Robert Shaw is covered in a heavy coat, hat and fake mustache, for 95% of the film. He exudes steely eyed menace. Travolta used playful smart guy remarks and bluster to make the character contemorarey and tattoos to create a sinister persona. Shaw does it with an even handed demeanor, he never really raises his voice but the timing and tone tell you he is not someone to be trifled with. His Mr. Blue is in control of the passengers, the hostage takers and the negotiator. In other films he can have a twinkle in his eye or a smile on his face to make a point. His narrowed eyes and soft voice are scary as hell after a mid story shootout. Listen to him talk to the conductor and your blood will run cold. 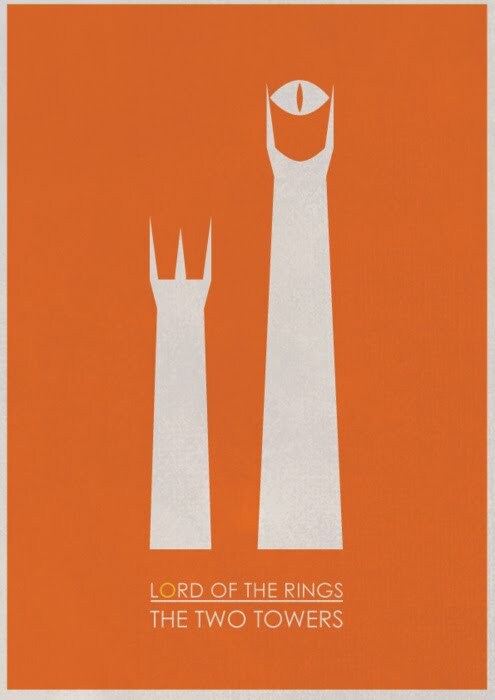 The Lord Of The Rings The Two Towers Extended Edition. There are many things to love about The Two Towers; the chase of the Uri-kai across Rohan, the restoration of Theoden and the casting out of Sauraman, the appearance of the Ents and their fateful decision to cast their lot with the men of the west. Whereas in the first film, we followed one group of adventurers on their quest, in the center part of the story, the group has been divided into three distinct units with their own narratives. The film cuts back and forth very effectively between the three stories, and builds tension in each section that leads to a reasonable climax for the film. 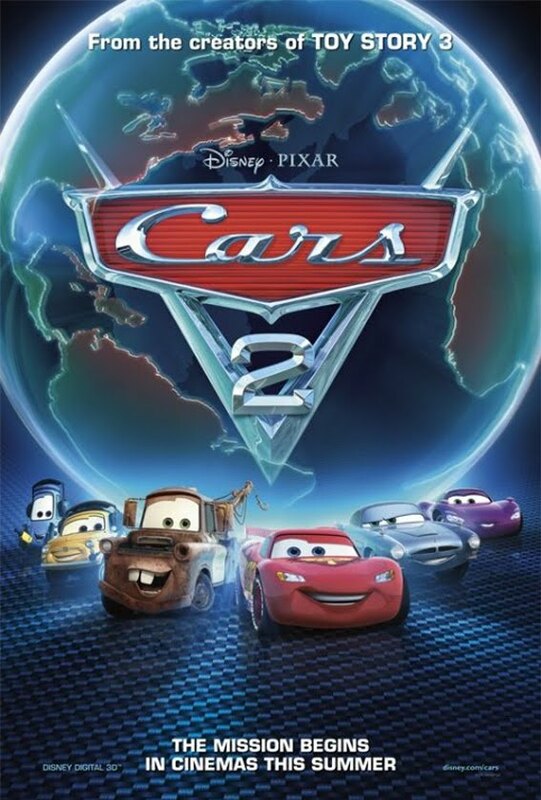 One plot development was postponed until the last film, but I think that makes the final film more effective and it lets this story stand a bit more independently as a result. There are great bits of humor used to keep things flowing as well. I think that the middle passage of this massive story could have languished if great care had not been taken with the screen play. 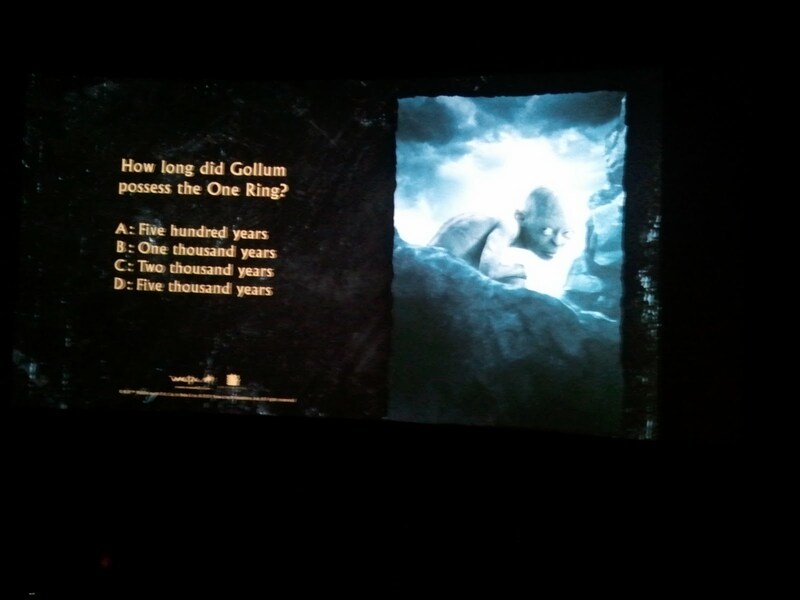 The character of Gollum/Smeagal gives the movie a narrative drive that is far stronger than if had simply been focused on the journey and quest. Theoden, King is one of my personal favorite characters. He resists the obvious, chooses the dangerous and rises to the occasion sufficiently to make the resolution of his story and those of the riders of Rohan much more meaningful. Next week I suppose I will weep again at the defiant words of Eowyn as she confronts the witch king and defends her Uncle, but without the setups provided here it would simply be a plot point. The extended edition also give a character that has already been killed off, a chance to deepen and create greater empathy for. Boromir is so much more clearly valiant as a result of his scenes in Gondor with his brother and father. The weariness with which he sets off to meet his fate is matched by his determination to save his land. The roll out of Farimirs character is more complete and again, the intertwining tragedies that all of these people must face in the course of the great conflict reflect the real nature of war and politics. There is so much going on in these worlds and not all of it is about the main quest. In the original theatrical releases of the movies, the story telling is tighter but not always complete. 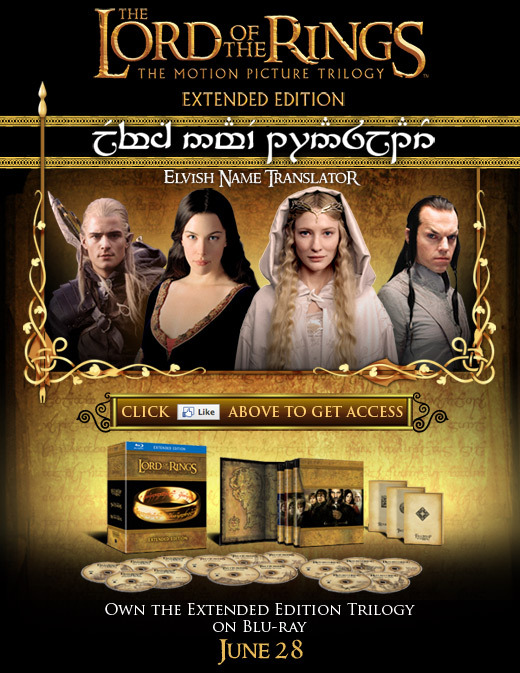 These extended editions do justice to the complexity of the world that Tolkien created. 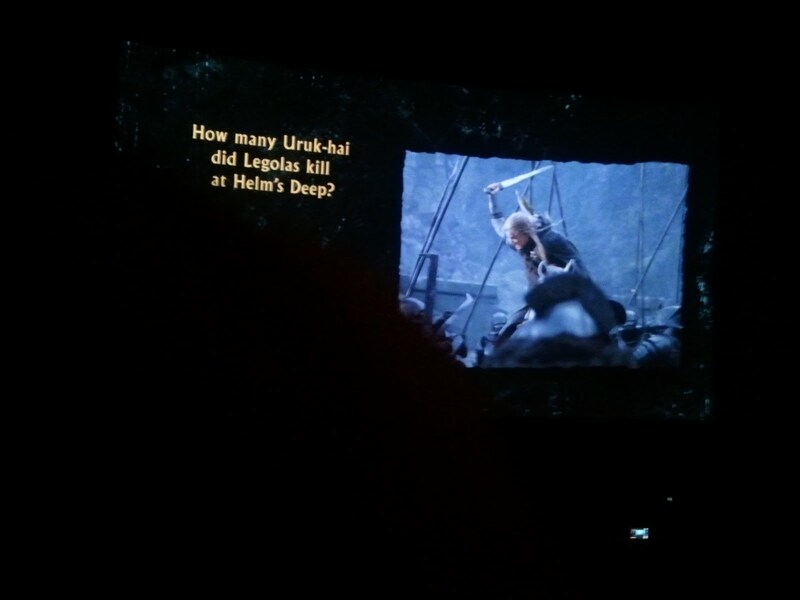 The Battle at Helm’ Deep is the climax of the film. It is loaded with dramatic action, humor and sacrifice. The desperate sense of doom that nearly overwhelms the forces aligned against Mordor does tend to hang over the film and make it the hardest of the stories to get through. Just as we reach the end of our strength, a character makes a breakthrough, or a tipping point comes down on the right side. Merry figures out a way to motivate the Ents, Aragorn restores King Theoden’s faith in his family history, Farimir chooses a path that his brother could not. We get to see these things happen when we did not before. Sam grows and shows us more signs that he can be the hero, not just the side kick, that he will need to be in the final chapter. Frodo’s fragile balance between savior and fallen is demonstrated by his charity towards Gollum and his impatience with Sam. Again there are dozens of seeds planted that will germinate and come to fruition in the last film. Those seed do have to be planted though and the film makers made that process a lot more interesting with the choices they made of what to add to the movie for the special edition. I will need to go out and get the soundtrack for the movie, because in addition to the fanfare theme set up in “Fellowship”, the sad violin based theme for the scenes in Rohan are featured. There are stirring action themes and character motifs in the rest of the movie as well, but the repetitive lament of a simple people, nearly wiped out and still holding onto their dignity, is one of the strong points of the film. My knowledge of music is scant, but my appreciation of it is immense, and this music made a real emotional difference in the film. As I said last week, this is one long commercial for the Blu Ray set that is coming, and the anticipation is heightened a couple of additional ways. 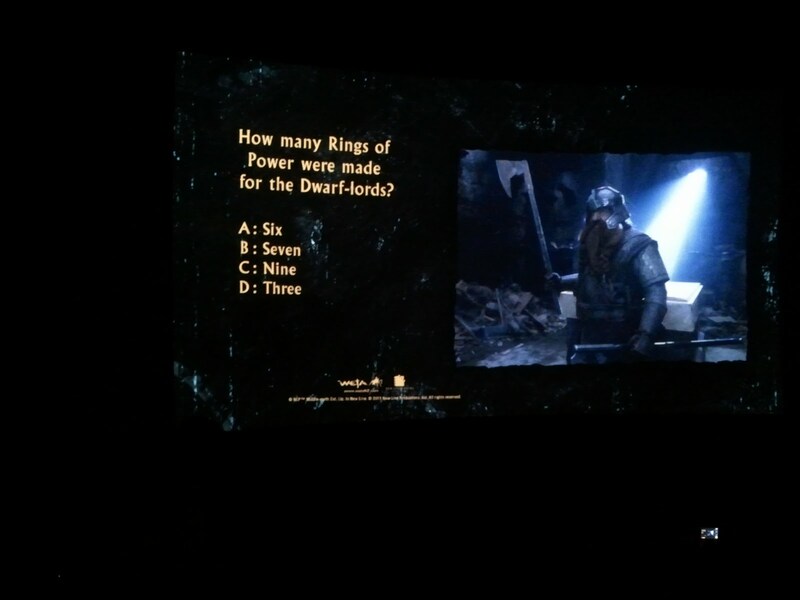 There is a long promo for “TheOneRing.net”, the fan driven site that will remind people of the coming version of “The Hobbit”, there is the aforementioned introduction by Peter Jackson, and there are pre-film screen cards with trivia from the films. I have included some phone snapshots of these to add to your experience here. I promise, if there is a teaser for the Hobbit next week, the internet will meltdown with commentary and I will be part of the flood. 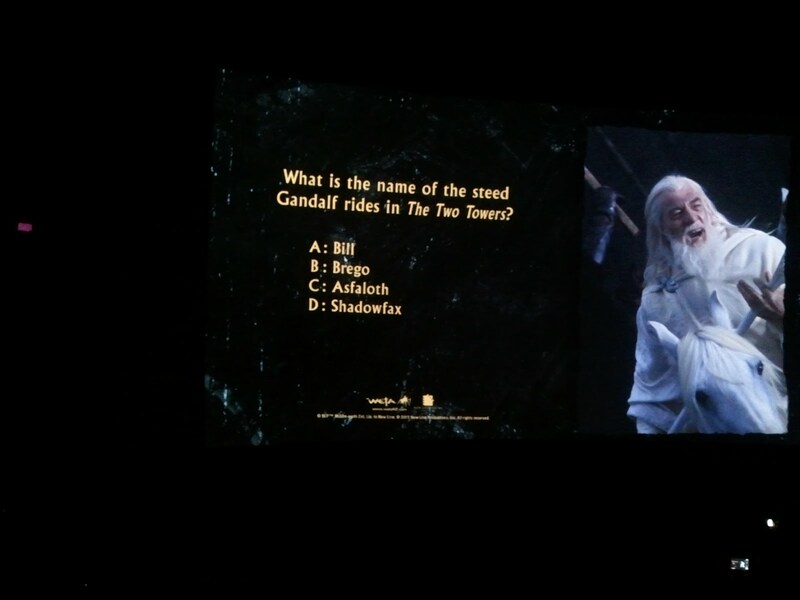 I don’t expect it, but all of the Lord of the Rings film experience have exceeded my expectation before, so we can hope. So last night we went to a three and a half hour commercial and paid $12.50 for the privilege. Next week we are doing the same, and then a week after that we do it again. Why, you might ask. It could have something to do with being big geeks, but the real reason is that movies are made to be seen in a movie theater. I love that I can own a movie and watch it anytime I like. I have a thousand or so movies in my collection, but I cannot enjoy them in a theatrical experience, no matter how big the TV is. I am not going to get 300 people, who all want to see the same film, to crowd around my family room TV. I can make popcorn, but it will not taste the same. Seeing a movie in a theater is a tradition that I treasure and seeing a movie I love in a theater is a memory that embraces all of my senses. “The Fellowship of the Ring” is the the opening chapter in the “Lord of the Rings Trilogy”. This movie series has been awarded, analyzed, worshiped and loved for almost ten years now. The DVD’s of the films have been available for almost as long, and the extended versions of the movies for just a little bit less than that. So why do we need it on the big screen? We need it there so that we can marvel at the full specter of Gandalf’s fireworks, so we can know how truly terrifying the Nazgul are when they attack. We need to jump at Bilbo’s two second possession. A Balrog can only be fully respected when it is forty feet high and everyone in the theater is in awe. I grew up in the seventies, before home video was available. We waited for movies to play on television, and you had to schedule your time to see them. You could not shift times, skip commercials, step out of the room or rewind. If you were lucky, a favorite film would play at the college or at a revival house, and you could see it again on the big screen. Some films were periodically re-released and you could catch up with a Disney movie or a James Bond triple feature. Today we are spoiled by the wonders of technology that allow us to carry a movie like “Avatar” around in our pockets and watch it on a three or four inch screen anywhere. Last night was an embrace and a rejection of that technology all at once. Digital magic created the world we were watching, and the Blu-ray experience will preserve that vision for as long as the technology is around. However, by not waiting for the home version, I got to be thrilled once more to a movie screening of a film I’d dreamed of for thirty years before it showed up. I remember saying to my friend, Dan Hasegawa, after we saw “The Empire Strikes Back”, that the puppetry and set design in that movie were the way to go in putting Lord of the Rings on screen. Although that version might be wonderful, I doubt that it would stand up very well to the rigors of the story that Peter Jackson told over the course of three films, that when viewed in their extended editions total twelve hours of movie. I’m glad they waited and I’m glad I get a chance to talk about it. In 2001, when The Fellowship first opened, I was not blogging and it never occurred to me that I could share my enthusiasm with anyone not right in front of me. Here we are ten years later and I hope that some of you that I don’t know, or at least don’t know personally will find my comments motivational. You should all look for a chance to see this movie on the big screen in whatever form you can. Most of you have probably done so already, but you need to go back, because it is just as inspiring again, even with the passage of time. 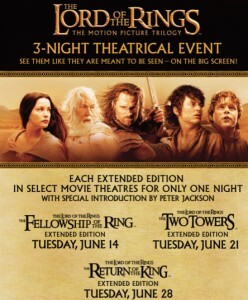 “Fellowship” is my favorite of the three films. Most of the fanatics I know prefer “The Two Towers”, and of course “Return of the King” won a bucket-load of awards including Best Picture from the motion picture academy. The opening film though is a promise made and a promise kept. There is great fidelity to the original story created by Tolkien, and it showed us that the film makers were taking this project quite seriously. I have to admit, I sometimes still dream of Sean Connery as Gandalf, not because Ian McKellan had any fault but because that is the casting I had in my head since the late seventies. Once Sir Ian takes the screen, there is no doubt he is the wizard we want. Fellowship contains his most dramatic moment, his fall in the mines or Moria. When Amanda was in middle school, reading the books a year or so before the movie came out, she got to that part, and came out of her room crying and sat on my lap weeping at the tragedy. Last night, despite my having read the books a dozen times and seen the movies at least as much, I was moved almost as much. The other big emotional moment for me is the brief fall and sad but honorable resurrection of Boromir. Capping the end of the first film, we know that there is drama in these movies and not just action visualized for the masses. 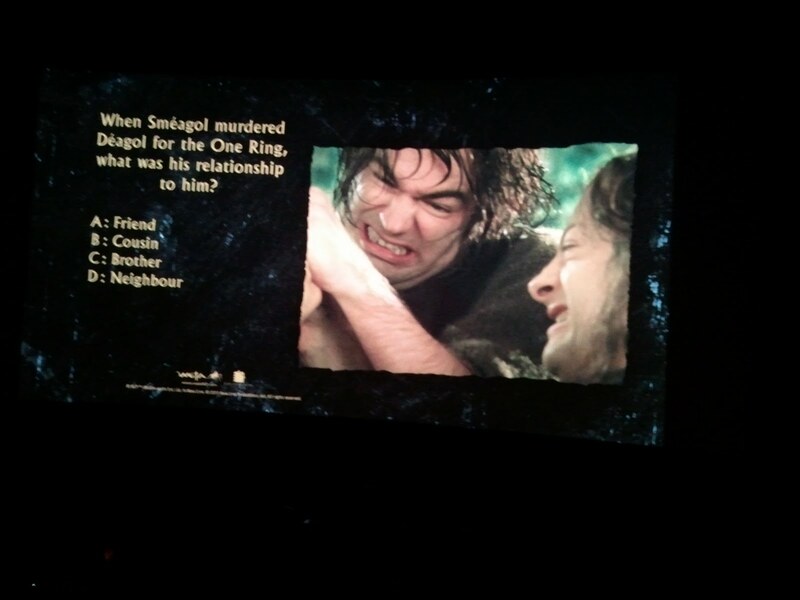 Peter Jackson gave a nice three or four minute introduction to the film, and then the extended version played. There were probably differences in the prologue, but the first visual distinction I saw was that the titles come up not on the green fields of the Shire, but the warm interior of Bag End. Bilbo is working on his autobiographical adventure story and maps, notes and writing implements are scattered around the room. He becomes a more important character in the story by this earlier placement and it also reminds most of us geeks what we have to look forward to in December of 2012. The other changes add details that make events clearer for anyone who had not read the books. We understand Aragorn’s self imposed exile better, the treachery of Sauraman is more vivid, and the gifts of Galadriel are more clearly placed in the story. My favorite new inclusion is the stanza of verse that Sam adds to the lament for Gandalf. His character is deepened even more by this one or two minute scene. Sam is the heart of this movie, and it is the first glimpse we get of how deeply he feels about everything that is happening. It may decrease the emotional impact of the late scene as he and Frodo separate from the others, but it makes his heart seem not only stout but warm as well. You all have seen the movies I’m sure, but you ought to see them this way to get the full measure of the story. The extended versions on the big screen, with an enthusiastic audience is a great way to spend an evening. I know that it is largely a promotional tool to sell Blu ray copies of a film most of you probably own. Well it works, and it comes by that effect honestly. Next week when we see Two Towers, I am sure there will be similar inspiring moments that remind me of the magic of Middle Earth but also the magic of the theatrical experience.